Students discover the life of the Hohokam, who inhabited this area over 1000 years ago. BTTP allows students to discover the life of the Hohokam who inhabited this area over 1000 years ago. Students are shown artifacts, plants, and animals that are found in Sabino Canyon and are encouraged by their observations and activities to imagine and share their ideas of life and survival in the desert. Emphasis is placed on necessities for survival (water, food, shelter) and the ingenuity of the Hohokam people to meet these needs. Students make clay pots and use a pump drill to make shell jewelry. Both are activities the Hohokam participated in while living in the Tucson Basin. PO2. Participate in guided investigations in life, physical, and Earth and space sciences. PO1. Give examples of how diverse people (e.g., children, parents, weather reporters, cooks, healthcare workers, gardeners) use science in daily life. Strand 3: Science in Personal and Social Perspectives. PO1. Identify various technologies (e.g., automobiles, radios, refrigerators) that people use. PO2. Analyze how the weather affects daily activities. PO2. Recognize that settlement led to developments in farming techniques (e.g., irrigation), government, art, architecture, and communication in North America. PO6. Recognize state symbols of Arizona (e.g., bird, flower, tree, flag). PO7. Recognize that people in Arizona and the United States have varied backgrounds, but may share principles, goals, customs, and traditions. PO3. Recognize through images of content studied (e.g., Egypt, Arizona, local community) that places have distinct characteristics. PO1. Discuss elements of cultural (e.g., food, clothing, housing, sports, holidays) of a community in areas studied (e.g., local community, Arizona, Egypt). PO3. Describe how people earn a living in the community and the places they work. PO1. Identify ways (e.g., clothing, housing, crops) humans adapt to their environment. PO2. Identify resources that are renewable, recyclable, and non-renewable. PO3. Recognize that some goods are made locally and some are made elsewhere. PO1. Identify how diverse people and/or cultures, past and present, have made important contributions to scientific innovations (e.g., Daniel Hale Williams [physician], Charles Drew [physician], Elizabeth Blackwell [physician]. PO1. Analyze how various technologies impact aspects of people’s lives (e.g., entertainment, medicine, transportation, communication). PO2. Describe important technological contributions made by people, past and present: automobile – Henry Ford, airplane – Wilbur and Orville Wright, telephone – Alexander G. Bell. PO3. Identify a simple problem that could be solved by using a suitable tool. PO3. Recognize how archaeological research adds to our understanding of the past. biographies) to study people and events from the past. PO4. Describe elements of culture (e.g., food, clothing, housing, sports, customs, beliefs) in a community of areas studied. PO4. Recognize that people trade for goods and services. PO5. Compare the use of barter and money in the exchange for goods and services (e.g., trade a toy for candy, buying candy with money). PO1. Identify how diverse people and/or cultures, past and present, have made important contributions to scientific innovations (e.g., John Muir [naturalist], Thomas Edison [inventor], Mae Jemison [engineer, physician, astronaut], Edmund Halley [scientist]. PO1. Describe the major factors that could impact a human population (e.g., famine, drought, disease, improved transportation, medical breakthroughs). PO1. Identify ways that people use tools and techniques to solve problems. PO2. Describe the development of different technologies (e.g., communication, entertainment, transportation, medicine) in response to resources, needs, and values. PO6. Describe ways humans use Earth materials (e.g., fuel, building materials, growing food. PO2. Recognize how archaeological research adds to our understanding of the past. PO2. Describe how physical and human characteristics of places change from past to present. PO1. Identify ways (e.g., farming, building structures and dams, creating transportation routes, overgrazing, mining, logging) in which humans depend upon, adapt to, and impact the earth. PO1. Identify how diverse people and/or cultures, past and present, have made important contributions to scientific innovations (e.g., Margaret Mead [anthropologist], Nikola Tesla [engineer, inventor] Michael Faraday [scientist], Benjamin Franklin [scientist]. PO2. Evaluate the consequences of environmental occurrences that happen either rapidly (e.g., fire, flood, tornado) or over a long period of time (e.g., drought, melting ice caps, the greenhouse effect, erosion. PO1. Describe the legacy and cultures of prehistoric people in the Americas: a. characteristics of hunter-gatherer societies b. development of agriculture. PO2. Describe the cultures and contributions of the Mogollon, Ancestral Puebloans (Anasazi), and Hohokam (e.g., location, agriculture, housing, arts, trade networks; adaptation and alteration of the environment). PO1. Describe how the Southwest has distinct physical and cultural characteristics. PO5. Describe how archaeological research adds to our understanding of the past. PO2. Describe the impact that natural events (e.g., floods, earthquakes, droughts) have on human and physical environments. Cultural Clues - Buried Treasure? Back to the Past provides a wonderful opportunity for children to imagine how it would be to live without modern technology and materials they take for granted. The Back to the Past activity focuses on the Hohokam, a prehistoric culture in southern Arizona between approximately 450 and 1450 CE (Common Era). They lived along the Salt and Gila Rivers and other waterways where wildlife and plants were plentiful and the soil was rich. The Hohokam culture extended from Mexico in the south to Flagstaff, Arizona in the north. Evidence of their presence has been discovered in the Tucson basin including Sabino Canyon. This activity helps students understand how archaeologists learn about the Hohokam by studying that evidence. . . their material remains. Hohokam means “those who have gone” or “all used up” in the language of theTohono O’odam, present day people whose oral tradition suggests they may be descendants of the Hohokam. With the support of visual aids and hands onactivities, students will learn how the Hohokam were able to meet all of their survival needs using only the natural materials from the immediate surroundings. For shelter, they built pit houses by digging a pit one to two feet deep into the ground using various tools including rocks, sticks and clay scoops. Trunks of Douglas fir or other trees and saguaro ribs were used for the frame which was then covered with brush and plastered over with mud and dirt. This design allowed the house to stay relatively cool in the summer and warm in the winter. The Hohokam depended on farming for much of their food. They grew corn, beans, squash and agave as well as tobacco and cotton, which they used to make cloth. To water their crops, the Hohokam created a complex network of irrigation canals, which was unsurpassed in prehistoric Northern America. The canals, some as long as 10 miles, rerouted the Gila and Salt Rivers and other waterways to water their fields. Some of the more than 150 miles of canals in the Salt River valley were renovated and put back into use in the 20th century. In addition to farming, the Hohokam continued the hunting and gathering practices of their ancestors. An important source of food were the beans of the mesquite tree. Mesquite beans were collected and ground with a stone mortar and pestle, called a metate and mano, or on a bedrock mortar. The mesquite flour was used for broths, breads and stews. Another important source of food was the ripe fruit of the saguaro. 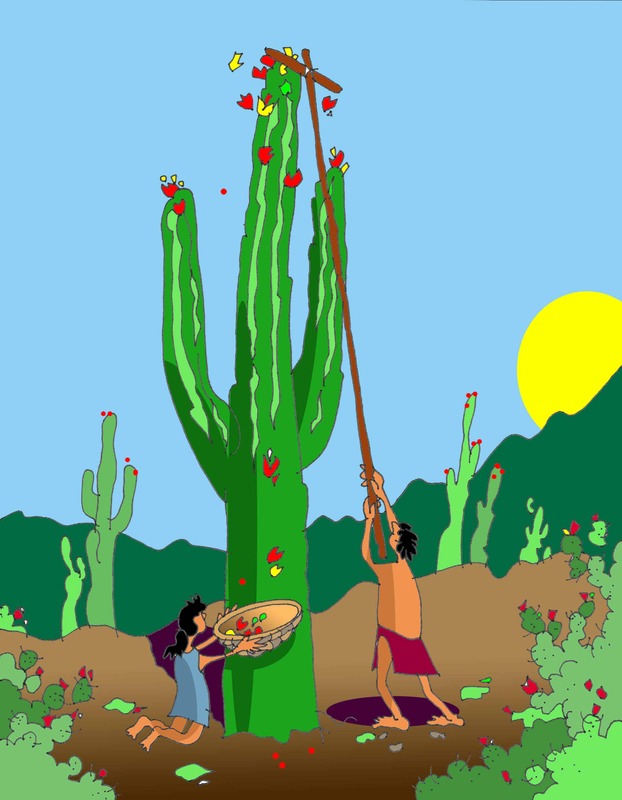 Because saguaros reach up to 50 feet in height, the Hohokam would use a long stick—usually a “rib” from a dead saguaro—to reach up to the top and knock the fruit down to the ground. The fruit was boiled down into syrup and cakes were made from the dried seed. The Hohokam supplemented their diet by hunting rabbit, deer and other animals. The Hohokam were also active traders with people from what is now Mexico. They obtained goods such as rubber balls, copper bells, turquoise, obsidian and macaw feathers to use in games, ceremonies and for making jewelry. They obtained shells from people living near the Gulf of California and the Pacific coast. They etched decorations into the surfaces of these shells with acid, becoming the first people in the world to use this technique. Shell jewelry made by the Hohokam was a valuable trade item. They also traded baskets they made from plant materials and pottery they produced using clay from the bottom of rivers or creeks. Although the Hohokam lived successfully in the desert for about 1000 years, they abandoned their settlements or “disappeared” between 1350 and 1450. The reason is unclear. Students are encouraged to suggest possibilities. Perhaps environmental factors such as drought, floods and worn out soil as well as disease were the reason. Cultural strife caused by changing social/political structures and religious beliefs may have contributed. Recent findings suggest the Hohokam culture “evolved” rather than “disappeared” as the people merged with other groups and adopted different technologies and traditions. It is a matter of debate and speculation among scientists. Ongoing exhibit – Paths of Life: American Indians of the Southwest and Northern Mexico. “Explore the origins, history and contemporary lifeways of ten native cultures in an exciting mix of prehistoric artifacts, historic objects, life-size dioramas and audio/video presentations”. The scientific study of people from the past through analysis of their material remains, such as, artifacts, irrigation canals and pit houses. Implements made of stone and used for hunting, cutting and digging. Any object made by humans. A shallow, polished depression in a large rock formation used as the lower stone for grinding substances. Mesquite pods ground in bedrock mortars using a small hand-held rock as the upper stone (pestle)becomes flour to be eaten raw or used in cakes or stews. A barrier built across a waterway to collect rainwater and prevent soil from being washed away (erosion). A period of dry weather, especially one extensive in time and injurious to crops. It is believed drought contributed to the disappearance of Hohokam in southern Arizona. Other suggestions include worn out soil, disease, changing religious beliefs and societal strife. The management of resources of a community with a view to enhancing its well-being. Hohokam pots, baskets and jewelry were likely traded for rubber balls, copper bells, shells and Macaw feathers from Mexico creating an economic system which benefited both cultures. Human and animal figurines made of clay, believed to have magical powers to protect their owners. An O’odam word meaning “those who have gone”, the name given prehistoric people of southern Arizona who lived in permanent settlements near rivers or streams where animals and plants were plentiful for hunting, gathering and other uses. A water source led them to develop farming which allowed them to stay in one place and create a community and techniques to improve survival. A ditch or waterway built to divert water from rivers or streams to crops. A metate is a stone with a flat, concave or trough-shaped upper surface, used as the lower millstone for grinding. It is usually shallow and can be movable, but can also be in bedrock. A mano is a smaller, relatively flat-sided stone used as the upper millstone to grind things on the metate. A season with heavy rains. A partly underground shelter. The pit is 1 to 2 feet deep. Trunks of trees serve as support posts. Ceilings are made of saguaro ribs and ocotillo covered with brush and plastered over with mud. Objects of baked clay. Clay from river bottoms provides material for making pots to carry water, to gather beans, fruit and seeds and to store them. Hand tools made of wood, leather and possibly bone, used for making holes in hard surfaces such as shells for jewelry making. BTTP Cultural Clues – Buried Treasure? Check with school officials to find out if your class will be allowed to bury a time capsule on school grounds. If so, determine where the site will be, how deep the item can be buried, who will dig the hole and any other preparations needed. An alternative would be to keep a time capsule in the school office or in a classroom. Begin this activity by asking the students “How do we know the Hohokam lived in Sabino Canyon so long ago?” Use this question to lead into a discussion of “cultural clues” from the past such as trash middens, pottery sherds, bedrock mortars, shelter ruins, etc. Explain how these “clues” or “evidence” help us to understand how the Hohokam lived, and that archaeologists are scientists who study such evidence to learn about prehistoric people. Next, ask the students what clues or evidence would be left behind if our culture vanished. Have the students brainstorm a list of things most indicative/representative of our culture. If they were to bury a few specific items in a “time capsule”, what would they include to tell future civilizations something about the way we live today? Have students volunteer to bring to school selected items from the list. Consider what kind of container to bury them in. Is it large enough and will it last in the ground for many years? Remind the students that the items they bring will be buried and not returned to them. A picture may be drawn or cut from a magazine to represent an object if it is too large or too valuable to put in the time capsule. To emphasize the importance of preserving cultural sites, ask the students to consider how they would feel if someone dug up their time capsule and stole the contents. Does this happen today? What can we do to prevent it? Bury the time capsule at the designated site. Dedicate the buried treasure for a particular class a few years into the future, perhaps ten. As a class, write a letter of dedication explaining the reason for creating your time capsule and include a detailed map illustrating where it can be found as well as the date it was buried. Ask the school office to keep the letter on file for the future class.